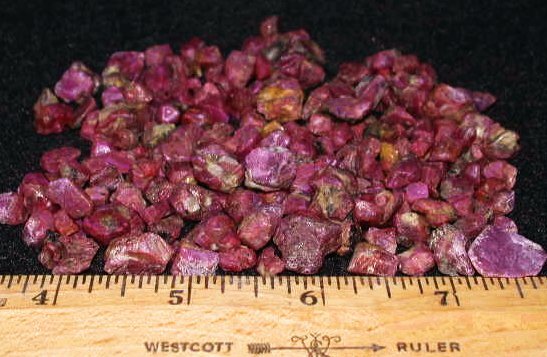 Sample Lot - 500 carats ruby rough pictured Each order is for 500 FULL CARATS Genuine Ruby rough Only $18.95 . Very nice color with some hex pieces. Sizes typically range from 5 up to about 15 millimeters. 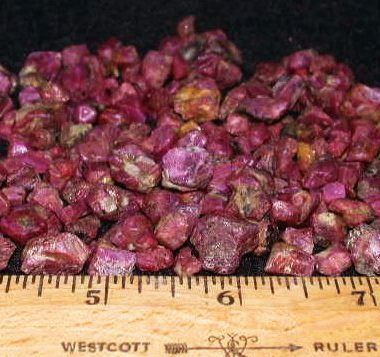 This ruby rough is excellent for creating cabochons and you should be able to make some nice star rubies. Each lot will be poured onto the gem scale at random until the weight reads at least 500 carats. We have a limited supply of this material. Like many of our offerings, this is a closeout. No more is available to us when we run out. wpcf-offer: <strong>Don’t Miss Out</strong><br/><br/> <strong>ORDER NOW, while it’s still available</strong><br/><br/> <img src="http://www.richmarkimports.com/wp-content/uploads/2016/09/guaranteed.gif" alt="guaranteed" width="80" height="80" class="alignnone size-full wp-image-79" /><br/><br/> <strong>And ORDER WITH CONFIDENCE because YOUR SATISFACTION IS GUARANTEED!</strong><br/><br/> Shipping charges depend on quantity and location. Shipping will be itemized during checkout prior to order completion so you can check it before purchase.